On May 14, 1948, Zionist pioneer David Ben-Gurion delivered Israel’s Declaration of Independence and declared the establishment of a Jewish state. Jews and evangelical Christians around the world rejoiced. But while crowds danced in the streets, the esteemed Ben-Gurion stayed in his office. There he pored over maps showing the array of Arab forces poised to imminently attack the Jews. 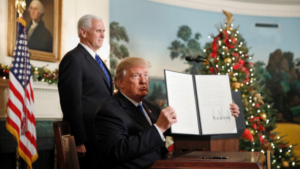 That night, Israel’s founding father wrote in his diary: “I feel like a mourner at a wedding.” [i] Ben-Gurion’s words describe well my reaction to President Trump’s recognition of Jerusalem as Israel’s capital. I believe President Trump did the right thing under difficult circumstances. I am not, however, giddily happy about it. At least not yet. Admittedly, my judgment is clouded by my perspective as a Jewish, dual American-Israeli citizen, Zionist, Bible believer, attorney, author-commentator on Israeli affairs, resident of Jerusalem and dedicated intercessor who loves the Lord. As such, I’ve learned that realities pertaining to Israel are highly nuanced and complex. Therefore, I am strongly urging believers to consider some of the less discussed implications of Trump’s announcement for the critical purposes of prayer. Like Ben-Gurion, I see a battle map, but in the Spirit. And like our Zionist forbear, I believe God will be with us in the fight. Now is the time for Israel loving believers to mobilize, “not against flesh and blood, but against rulers, authorities, powers of darkness and forces of evil in heavenly realms.” (Ephesians 6:12) I believe 8 key issues emerge as vital prayer points after Trump’s announcement. 8 happens to be the number symbolic in Scripture of new beginnings, and US recognition of Jerusalem is certainly a new, good beginning. After the Jews accepted the Partition Plan and declared statehood, the Arabs started a war. When that happened, a confused and militarily impotent UN essentially fled the scene. Israel was left by herself to defend the Holy City. (Actually, all of Jerusalem had been set aside for the Jews in 1922, but that is another story.) So while Trump’s announcement does violate international policy, it does not violate international law—if the term “international law” is used justly, fairly and with integrity.Pray against premature works by spirits of antichrist and lawlessness seeking to change laws and seasons. (Daniel 2:21, 2 Thessalonians 2:1-12) Pray for justice at the UN, which means a revival of fair and honest interpretation and administration of righteous, traditionally based laws. Pray for more and more nations to opt out of any wrongful global agendas and recognize Jerusalem as the capital of Israel. 7. Iran is a far more serious threat to Israel than the location of nations’ embassies. And only America, apart from the miraculous, seems capable of spearheading effective opposition to Iran. Unfortunately, Trump’s announcement has upset every state in the region, excepting Israel. Some Israelis are concerned the US could lose its influence in the Middle East due to backlash over Jerusalem. As it is, Russia is currently the regional power broker. (This resulted from Obama’s neglect of the Middle East, Trump’s political inexperience, and President Putin’s passion to restore Russia to superpower status.) Today, Israel’s relationship with Russia is tenuously good. But Russia has had no love affair with the Jews. Moreover, she is a—or the—prime supporter of Iran, still hell-bent on Israel’s destruction. Iran’s empire-caliphate is now set to extend to the Mediterranean Sea through its proxy terror groups, positioned but a few miles from Israel. Mr. Putin, who is almost certain to be reelected in March, and Mr. Trump do not get along. The Jerusalem announcement is likely only to increase hostilities between these two superpowers. This could leave Israel torn between its most critical allies. It seems the alignment of nations described in Ezekiel 38 could be cementing even as I write. Pray that if Trump’s announcement tilts us in the direction of war, that such a war will take place only with God’s permission and in His timing. Pray that it will be contained, causing the minimal amount of harm necessary in order to achieve God’s purposes. Pray that recognition of Jerusalem releases not war but peace, truth, freedom and salvation in the Middle East. 8. Despite all the above, you and I should be encouraged! President Trump has done something right. 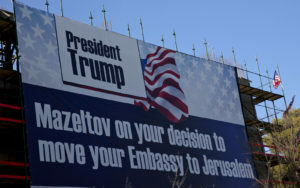 By recognizing Jerusalem as Israel’s capital (and planning to relocate America’s embassy there) he has withstood those who oppose God’s purposes in the earth. We should not be surprised that strong resistance follows. Upsetting the kingdom of darkness can be messy at best. At worst, many lives can be tragically lost or destroyed. Therefore, now is the time to pray for God’s strategies to be released concerning Jerusalem! Today, kingdoms are being shaken. As evil is challenged, a global harvest awaits. Let’s do our part in prayer and strategic initiative to welcome the glory God desires to pour out, fulfill the Great Commission, and prepare Jerusalem for her King! [i] David Myers, “Partition and the triumph of Zionist pragmatism,” Nov 24, 2015, http://jewishjournal.com/opinion/179835/ November 24, 2015; S. Teplinsky, Why Care About Israel? Grand Rapids, MI, Chosen Books, 2004, 192. [ii] This point was similarly noted by David Horowitz, “While endorsing Israeli Jerusalem, Trump doesn’t rule out any of Abbas’s demands,” The Times of Israel, December 6, 2017.